Currently, the biggest news in football is not about anything done on the field, but everything off it. Carolina Panthers Greg Hardy was convicted of domestic violence this summer. Last week Ray Rice was cut from the Baltimore Ravens and indefinitely suspended from the NFL after video footage of him punching his then-fiancee in the face was shown on the news. And this week Minnesota Vikings running back Adrian Peterson was arrested on child-abuse charges after he reportedly beat his 4-year-old son with a switch. On Sunday ESPN's Sunday NFL Countdown, a roundtable discussion of all things football, attempted to handle these delicate issues as personal stories of abuse and the fighting back of tears took the place of what is usually lighthearted banter about the day's upcoming games. There's no room in our world for what we've seen. If I was to close my eyes, one thing I remember vividly was my mom being beaten. The one thing I also remember is not one of the men who beat my mom was in the National Football League. This is not a football problem. This is a world problem. Every nine seconds a woman is being brutally beaten. It bothers me a little bit when we're the focus of this attention. We all know Ray Rice did something horrific. You can't get away with hitting a woman, but that didn't start with Ray Rice. We have to find a way to stop violating women. That's where it starts. As a child, my greatest motivation was to make sure as a man, not an NFL man, that a man never put his hands on my mom again. In July Hardy was convicted of domestic violence charges after it was reported that the 6-foot-4, 275-pound defensive end "choked his then-girlfriend, threw her around, dragged her by her hair and threatened to kill her," according to Fox News 8. Hardy was sentenced to "18 months of probation and a 60-day suspended sentence," according to Fox News 8. Although Hardy is appealing the conviction, critics have been furious that the Panthers have issued no suspension. Hardy played in the Panthers' first game against the Tampa Bay Buccaneers and was slated to play against the Detroit Lions this Sunday. "How could you allow Greg Hardy on the field?" former Denver Broncos linebacker Tom Jackson asked his Countdown colleagues. "Due process has played out. He's convicted. He's appealing. We know the facts of the case. They're undisputed." During the broadcast it was announced that Hardy had been deactivated from Sunday's game. "At least in this instance, Mr. Richardson and the Carolina Panthers got this right for this moment," Jackson said. 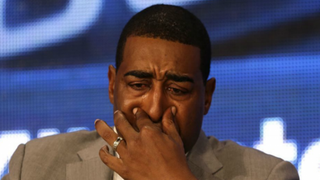 As the discussion moved to Vikings running back Peterson's child-abuse charges and photos of the slashes left on his 4-year-old son's body from a reported switch beating, Hall of Fame receiver Cris Carter became overcome with emotion. "This goes across all racial lines, ethnicities, people believe in disciplining their children. … My mom did the best job she could do raising seven kids by herself, but there are thousands of things that I have learned since then that my mom was wrong," he said. "It's the 21st century; my mom was wrong. She did the best she could, but she was wrong about some of that stuff she taught me, and I promised my kids I won't teach that mess to them. You can't beat a kid to make them do what they want to do!" Carter, who played 12 seasons with the Vikings, noted that he was proud of his team for taking swift action against Peterson. The Vikings deactivated Peterson as soon as the news broke. "Take him off the field," he said, slapping his hand against the desk. "As a man, that is the only thing we really respect. We don't respect no women and we don't respect no kids. … Take them off the field because we respect that." Read more at Fox News 8.